As expected, following the victory in the Iraqi parliamentary elections of the Muqtada al-Sadr bloc, together with pro-Communist parties, a serious political crisis has broken out in the country, which has yet to form a government. The winning parties campaigned on a platform based on eliminating Iran’s dominating influence in the country and on initiating a national and religious peace process. 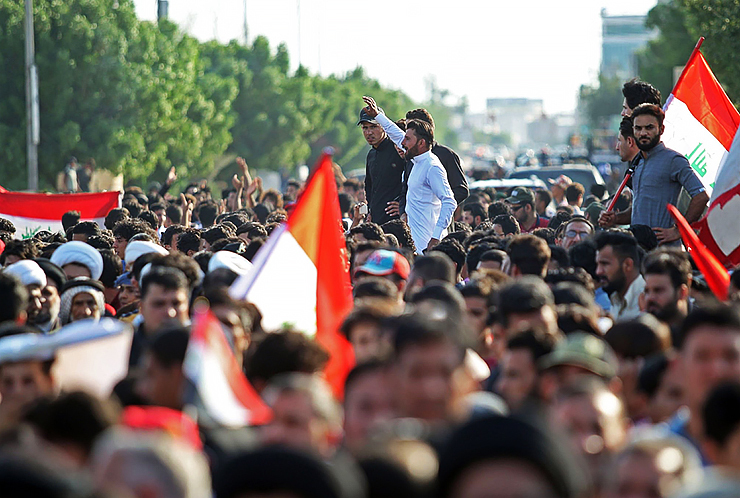 Unsurprisingly, the focus of the unrest is the Shi’ite-dominated south of the country, where widespread scale protests have broken out over last few days, starting in Basra and then spreading to more and more cities. The protests are focusing on economic and social issues, in particular rampant government corruption, unemployment and the high level of poverty. However, the social protests are rapidly turning into anti-Iranian protests. The protesters have been shouting anti-Iranian and anti-clerical slogans and have stormed and taken control of buildings belonging to the pro-Iranian Hashd al-Sha’abi armed group and its key member, the Badr Organisation. Both the army (including, as of July 16, the 9th Armoured Division, equipped with new tanks) and pro-Iranian vigilante groups have been sent in to suppress the protests, and these forces are being transferred from areas in three Iraqi provinces that are, in effect, unofficially controlled by militants from the terrorist organisation DAESH (banned in Russia). However the protestors represent a more serious danger for the government than DAESH, as the loss of the Shi’ite south would be a catastrophe for Baghdad. Protests are also taking place in southern areas and suburbs of the capital, which have a large Shi’ite population, who migrated to the area as refugees after the first Gulf War (or Operation Desert Storm) in 1991. These protestors are using the same slogans and tactics. As the majority of Baghdad’s Shi’ites support Muqtada al-Sadr. A curfew has been introduced, and the army has been put on high alert. The sequence of events can be summarised as follows: On June 6, as frequently occurs, a number of residential areas of Basra experienced power cuts. These cuts are a particular problem in summer, when the heat (which frequently exceeds 60 degrees C at this time of year) forces residents to switch on their air conditioning, and as a result the electricity grid gets overloaded. This time the cuts lasted longer than usual and they affected social facilities including schools, kindergartens and medical centres. People went out onto the streets and spontaneous protests broke out. The situation was made worse by the current state of drought: the mains water system is unable to supply as much water as it normally does. Between July 7-10 the protests spread all over the province and to neighbouring areas, including Maysan, Dhi Qar, Najaf, Babylon and Nasiriyah. The demonstrators destroyed branch offices of political parties and police stations, and damaged infrastructure belonging to oil companies (including attempts to ransack the foreign oil workers’ compound at the West Qurna Oil Field, where the American company Exxon Mobil and the Russian company Lukoil are operating). They have also seized and burned dozens of cars, damaged power supply lines by destroying transformer stations, robbed dozens of warehouses and shops, and blocked access to sea ports with improvised barricades. All the main roads were blockaded and military facilities surrounded by protesters. On July 14 riots spread through the towns of Najaf, Karbala and Babylon, and there were a number of demonstrations in al-Shuala, a southern district of Baghdad. In Najaf a crowd broke into the grounds of the airport and prevented it from operating for several hours. According to foreign media reports dozens of people were killed and wounded. Towards the evening of July 14 the Iraq government was forced to call an emergency session of the National Security Council, attended by representatives of all the state security bodies. The Prime Minister, Haider al-Abadi, ordered internet access to be cut off in almost the whole of the country, apart from the northern provinces, and declared a state of emergency. Anti-terrorist divisions were rapidly sent from northern and western provinces to the south of the country, and the transfer of troops from the elite 9th Armoured Division of the Iraqi Army began. By July 16, the situation had calmed down somewhat, but tensions were still high. Apart from its fight against the terrorist organisation DAESH (banned in Russia), the events in Basra represent the most serious challenge that the Iraqi state has faced in recent years. It is clear that Iran, in spreading the ideology of its revolution, has achieved something that was, basically, inevitable: it is hated by large parts of the Iraqi population and has to resort to force in order to keep hold of the territories that it controls. Iraq lost its sovereignty after the US invasion in 2003, and, entirely as a consequence of this one occupation, it almost immediately entered its ‘Iranian’ phase. The Iraqi authorities, learning from the protests that took place in Iran last winter and in June this year, introduced emergency measures in order to isolate and destroy the protest movement’s nervous system. The internet has been cut off, telecommunications services are subject to interruptions and very little news is coming in from the south of the country. It is strange that Muqtada al-Sadr, who won his election victory by using the same slogans as the protestors, is in no hurry to lead the protests or even state his position in relation to them. If he continues in this way, it looks as if he may end up losing out: his inaction may cost him all the popular support he gained during the election campaign. On Sunday July 15, in response to the widespread crisis that has engulfed the whole of southern and most of central Iraq, the national government allocated 3.5 trillion dinars and started making major staff changes. In fact, the unrest and large-scale popular demonstrations in Basra started as early as July 6, but the Iraqi government did all they could to stop news of the protests getting out. It was only when the protestors took control of Najaf international airport, and demonstrations swept through Babylon and reached the southern districts of Baghdad, that it became clear that it was no longer possible to hide what was happening and that emergency measures urgently needed to be taken. The policies and reactions of local government bodies at the provincial and municipal levels has demonstrated that they are completely incapable of dealing with the situation and lack basic management skills. All the local government staff simply fled or took refuge in police and military bases, which, most importantly, were not attacked by demonstrators. The central government, by trying to put on a brave face in this bad situation, has clearly missed its chance to deal with the situation and, taken by surprise, has resorted to reshuffling the cabinet. The crisis in Basra has been brewing for years, and Baghdad lacks any effective tools to resolve the situation. Apart, that is, from reallocating budgets, a policy which raises a lot of questions. After all, the subsidies and financial support are still being provided using the existing mechanisms, which are tainted by corruption at all levels, from the very top right down to the bottom. But the authorities have acted quickly in one respect: they have rushed to blame what has happened on “intrigues by political enemies” and on the actions of neighbouring Iran, which, they claim, is seeking revenge for the pro-Iranian parties’ defeat in the elections. It is possible that there are indeed Iranian emissaries active in the south of Iraq, but it is highly unlikely that they are responsible for organising and coordinating the popular protests. Nevertheless, the events in the south of Iraq are very dangerous, and the calls for regional autonomy – at the least a status similar to that of Iraqi Kurdistan – are getting louder and louder. The situation is still very complex,but we can already conclude that Iraq’s whole state system is in a deep crisis, a crisis that is due to the fact that it is founded on the fragments of the previous regime.